A ruptured (burst) aneurysm is life-threatening. It often happens suddenly and without warning. A ruptured aneurysm can cause dizziness, sweaty skin, fast heart rate, shortness of breath, feeling faint and loss of consciousness. If you think you or someone near you is suffering from a ruptured aneurysm, phone 111 for an ambulance immediately. 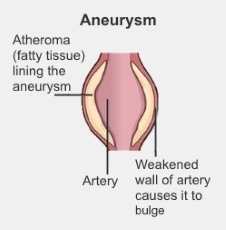 An aneurysm (an-yur-ism) is when the wall of an artery bulges due to a weakness in the artery wall. Sometimes an aneurysm can rupture (burst). This is a medical emergency. An aneurysm can happen in any of your body's arteries. The most common types of aneurysms are described in Types of aneurysms. Doctors don’t know exactly what causes an aneurysm. But you may be more at risk if you're male, smoke, have a family history of aneurysms, and have high blood pressure or atherosclerosis. Some people are born with a very narrow or weak artery, which can increase the risk of getting an aneurysm. If your doctor suspects you may have an aneurysm, they may arrange tests such as an angiogram or a vascular ultrasound. For more information about these tests, see Tests for blood vessel problems. The treatment will depend on your general health, the size of the aneurysm and your symptoms. Treatment options include reducing your risk factors, medication, monitoring (surveillance) and surgery. This is where your doctor will use regular ultrasound scans to monitor the size and growth rate of your aneurysm. ligation, where the surgeon ties off your artery to stop the blood flowing and stop the aneurysm growing. This is used for popliteal aneurysms. Christchurch Public Hospital's Department of Vascular, Endovascular, and Transplant Surgery. American Heart Association – What is an aneurysm?, retrieved December 2016. Australian and New Zealand Society for Vascular Surgery – Aortic aneurysm, retrieved January 2017. Center for Vascular Awareness – Mesenteric artery aneurysm, retrieved December 2016. NHS – Brain aneurysm, retrieved January 2017. Society for Vascular Surgery – Peripheral aneurysm, retrieved December 2016. Society for Vascular Surgery – Thoracic aortic aneurysm, retrieved January 2017.